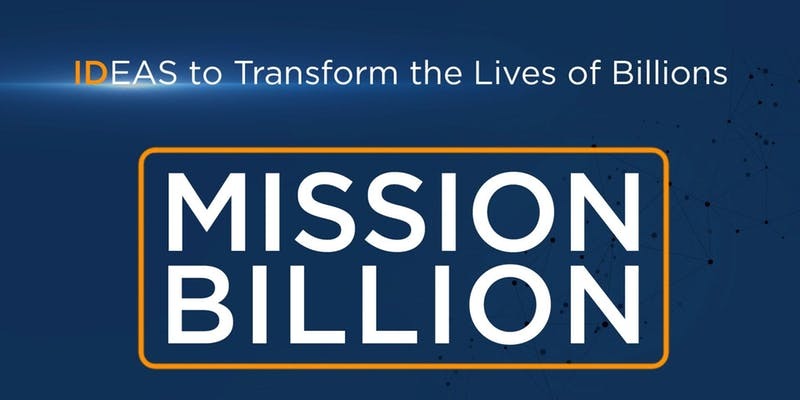 What is the focus of the Mission Billion Challenge? Providing greater oversight and control of personal data. Solutions that enable individuals to inspect, update and correct personal data; provide transparency regarding who has accessed their data and for what purpose; and the ability to seek redress for unauthorized use. Preventing the misuse of personal data. Solutions that can help protect an individual’s personal data from misuse or unintended disclosure, such as through minimizing, hiding, compartmentalizing personal data, tamper proof logs, or other means. Such ideas and solutions should be practical, cost effective and be relevant for developing country contexts in which some segments of the population may have low literacy and numeracy levels, as well as limited digital skills. To maximize the development impact and wide-spread adoption, all submission shall be open solutions, i.e. made available on public licenses that allow re-use without restrictions. The Challenge is open to Contestants (‘Contestant”) from member countries of the World Bank (see: www.worldbank.org/countries). Contestants may be individuals or organizations (profit, non-profit organizations, academic). Contestants are responsible for compliance with legal requirements of their country. A) Individuals must be of at least 18 years of age at time of entry. Individuals may form teams and submit entries on behalf of teams. Individuals who join teams must meet the eligibility requirements for Individual Contestants. B) Organizations must be legally established entities (profit, non-profit, academic) in their respective countries. C) Staff, contractors and vendors of the World Bank Group (The World Bank Group consists of the International Bank for Reconstruction and Development, the International Development Association, the Multilateral Investment Guarantee Agency, the International Finance Corporation, the International Center for the Settlement of Investment Disputes. ), the members of the Evaluation and Finalist Judging Panel or any company or individual involved with the design, production, execution or distribution of the Challenge and their immediate family members (spouse, parents and step-parents, siblings and step-siblings, and children and step-children, aunt, uncle, niece and nephew) are not eligible to join the Challenge. D) Sovereign and sub-sovereign agencies, and intergovernmental agencies are eligible to submit solutions to the Challenge and will be judged along with all of other submissions. However, these agencies are not eligible to receive cash prizes if they are selected as a winning solution. For complete details on the terms and conditions that govern the Mission Billion Challenge please refer to the website. To submit an application for the Mission Billion Challenge please refer to the website.